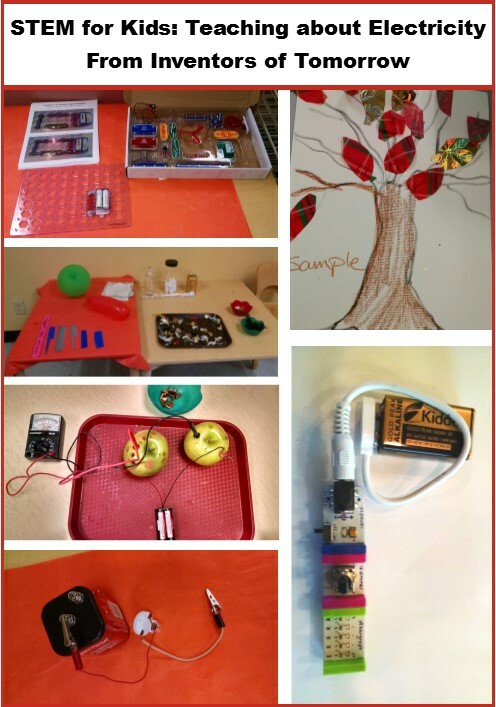 Here are the activities we used to explore electricity in our Family Inventor’s Lab, a STEM class for families with kids age 3 – 7. Lighting a Bulb: The simplest, most straight-forward way to illustrate a circuit is to use a lightbulb on wires, and hook it up to a battery. You hold up the lightbulb and ask why it’s not lit. They say because it has no power. You hook one wire to the battery, then ask them if it’s lit. Then hook the other wire up. Now the light comes on. 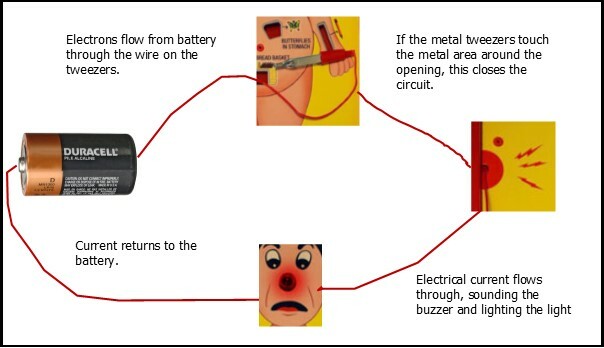 Point out the circuit – the electricity is pushed by the battery into this wire, then through the light, then through this wire back to the battery. Challenge: Can you create an electric circuit using play-dough? We made two batches of play-dough, one conductive (made with salt and cream of tartar) and one insulating (made with sugar and distilled water). See recipes at http://courseweb.stthomas.edu/apthomas/SquishyCircuits/ or www.instructables.com/id/How-to-make-conductive-play-dough/?ALLSTEPS.) We also had battery packs and LED Lights. 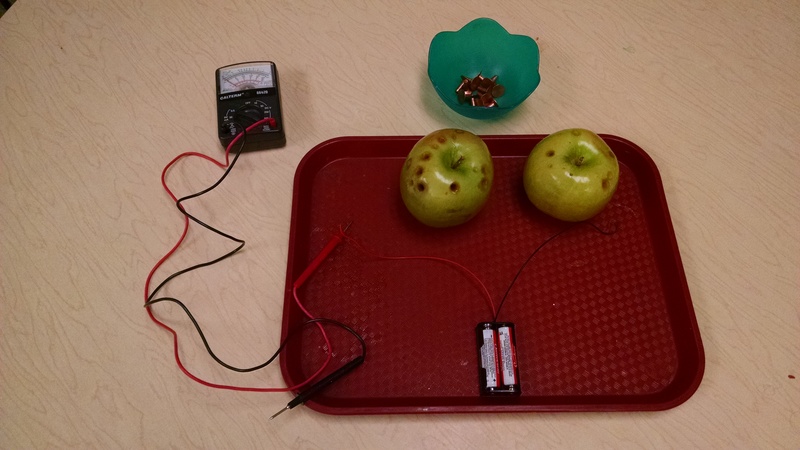 A simple circuit involves taking two balls of conductive dough. Push one wire from the battery pack into ball 1 and the other wire into ball 2, then insert one wire from the light into ball 1 and one into ball 2. Show the children the circuit. Lemon Battery Battery: So, on many websites, and in many kids’ books about electricity, you’ll find directions for a lemon battery – you put a penny and a zinc screw in a lemon, and use it to light a lightbulb. The science behind this is something like this: What’s happening in a voltaic battery: two electrodes – one copper and one zinc – are submerged in an electrolyte – an acidic solution (lemon juice in this case). Zinc and lemon produce electrons and copper and lemon lose electrons. Electrons pass through the lemon juice from one battery terminal to the other, creating electricity. The idea for the experiment is: roll the lemon with some pressure to get it juicy, then insert into the lemon one zinc item (screw or eyelet) and one copper item (copper wire, rivet or copper penny – from before 1982 when pennies were more copper than zinc). Be sure the two metals don’t touch. Then take a lightbulb on wires – touch one wire to the zinc item and one to the copper to light the bulb. (Or so several sites / books claim.) We found that the current produced by the battery was way too weak to light even a very low voltage LED. We did get a voltmeter which could measure the current to show a small reaction was happening. Create electricity with a hand generator: We had a crank-powered flashlight and emergency radio plus several small flashlights with dynamos. (Like these, but we got ours in the Daiso dollar store for $1.50 each.) These were a great free play activity for the active kids – we turned off most of the lights in one room and they just played with flashlights and did flashlight tag. 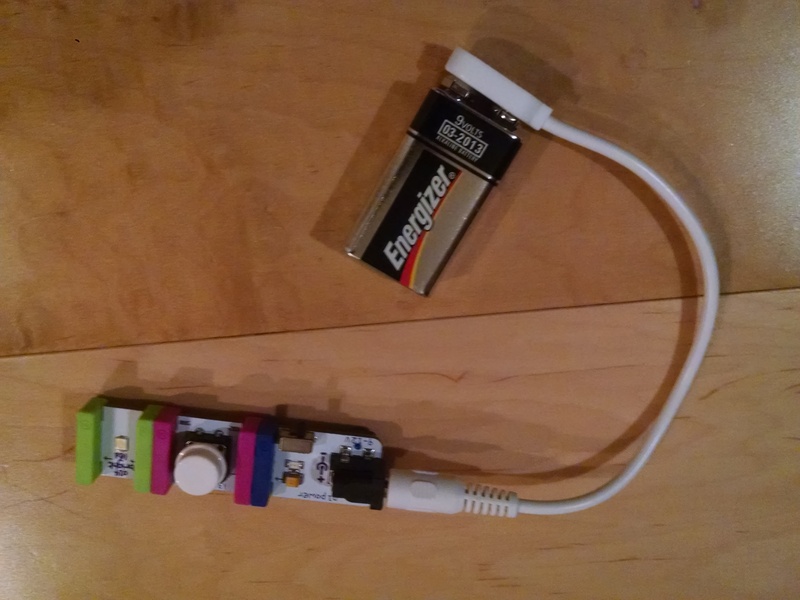 littleBits: We had the littleBits Electronics Base Kit . littleBits is kind of the Lego of electrical circuits. It’s a modular system, with little bits that click together with magnets, so it’s easy for even small children to assemble them correctly. There are inputs (buttons, dimmer switch / volume control, sound activated switch, etc. ), and outputs (lights, buzzers, motors, etc.) The base kit comes with an instruction book to explain the basics, but also “ideas to get you started” on other things you can invent. I have a detailed review of littleBits and Snap Circuits here. Snap Circuits is another modular electronics kit. Kids snap items on to the base plate, such as battery packs, switches, lights, and motors. Then they snap on wire modules to complete the circuit. The set comes with an instruction manual, but I’ve created my own simplified directions for 5 of the projects. Our 5 – 7 year olds could assemble them but they were beyond the fine motor skills/strength and beyond the cognitive grasp of our little ones. Find a detailed comparison of these and littleBits here. Sensor Toys: Ok, I know you’ve all seen toys during your life where if you touch two metal contacts on the bottom, it completes a circuit and the toy does something. Years ago, my daughter got a toy chick one Easter that would chirp when you held it in your hands. When she brought her chick to kindergarten, she and her classmates discovered all sorts of cool concepts about electricity by playing with it. For example, if one person touches one contact and another person touches the other contact, the bird does not chirp. But then when those two people hold hands (to complete a circuit) the bird chirps. The bird chirps when set on a metal surface but not if set on wood or rubber, and so on. Her teacher, a master of emergent learning, was so excited by this. He said he wanted to jump in with “ooh! ooh! it’s electricity” and explain it all at the start of the day. Instead, he told me he “sat on his hands” all day and didn’t explain it until the end of the day when he asked the kids to share all the things they learned, make observations about what made the chick chirp and what didn’t, and what they thought was the reason. And only after that discussion did he explain the principles of electricity. Operation. We put out the classic board game Operation. The goal of the game is to use wire tweezers to pick little pieces of plastic out of openings without making it buzz and light up. So, let’s look at the science… why does it light up and buzz? Our 3 – 4 year olds basically just had fun setting off the buzzer over and over. 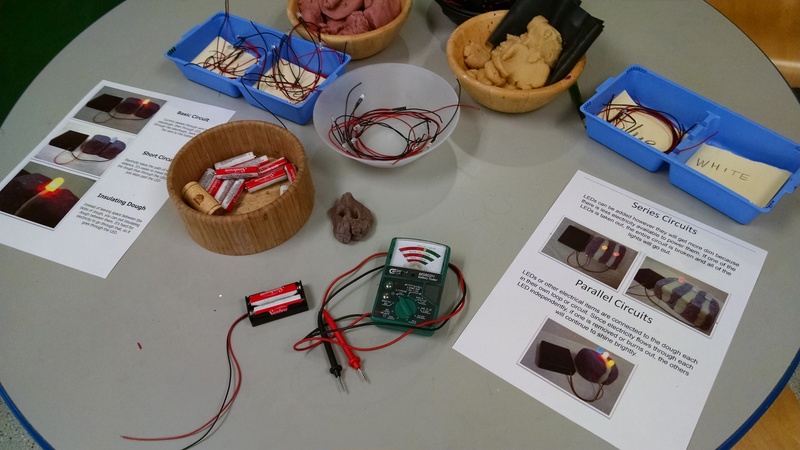 Our older kids got both the point of the game (to try to get the plastic out without hitting the buzzer – a great fine motor challenge) AND got the idea of the electrical circuit. Here’s a poster to go with this activity. History and an Experiment to Go With It: 2,500 years ago a Greek mathematician and astronomer named Thales (TAY-less) first noticed the effects of static electricity. He was polishing a piece of amber, with a piece of wool or fur. Thales discovered that after he rubbed the amber that it attracted dust particles or other light objects like straw or feathers. (More history here: http://inventionofelectricity.weebly.com/contributors.html) You could re-create this in class with amber, sheep skin, and feathers. Static Station. We offered multiple ways to generate static electricity – balloons kids could rub in their hair, combs and a plastic ruler that they could rub plus wool and silk to rub them with. Then we offered multiple items that will react visibly to the pull of static electricity. 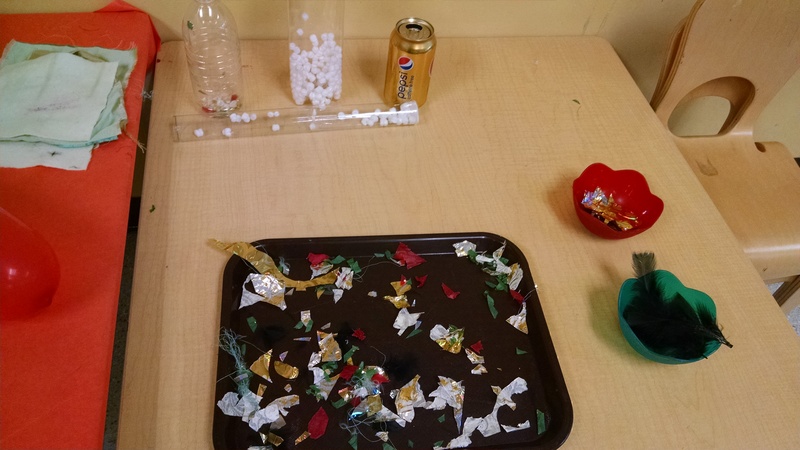 Some options are: puffed rice cereal, torn up tissue paper, plastic tubes filled with Styrofoam pellets, feathers, rabbit fur, and an empty aluminum can. You can also have a plate of salt and pepper. Wave the static charged balloon over it – the pepper will fly up first, and the heavier salt will be slower to attract. You could have a contest where kids charge their balloons, then stick balloons to a wall, and see whose balloon stays stuck the longest. Make Lightning: http://www.learnplayimagine.com/2013/04/how-to-make-lightning.html has two methods for getting a spark. We haven’t tested these. Water table: Have a static generator (balloon and hair, or amber and wool, or comb and wool) next to the water table. Charge it up, then pour a trickle of water past it – will the static electricity “bend” the stream of water? Here’s a poster to go with this. The bending water is a little subtle. The littlest kids don’t really get it. The 5 – 7 year olds would understand it if FIRST we showed that normally when you pour water, it flows straight down, then we showed how the static bends the water. Art: We’ve tried a few ideas, which are tangentially related to electricity. 1) drawings with Spirograph to represent electron orbits. 2) Scratch art pictures of lightning bolts… scribble with oil pastels to fill a piece of paper with bright colors. Paint over that with dark blue/black acrylic paint like the night sky. While the paint is still wet, use a stick to draw lightning bolts – it will move the paint aside to reveal the colors below. 3) Use electricity to draw by using a record player turntable. Put a paper plate on where the record goes, turn it on, and draw. 4) You could build a Scribblebot and use that to make art. You tape three markers onto a plastic cup to form “legs” on the robot. Add a motor and a battery, and your scribble bot dances around, leaving a drawing behind. Tissue Paper Art: On I Heart Crafty Things, we found this great idea for a butterfly made of tissue paper where the wings will flutter in reaction to a static electricity source such as a charged up balloon. 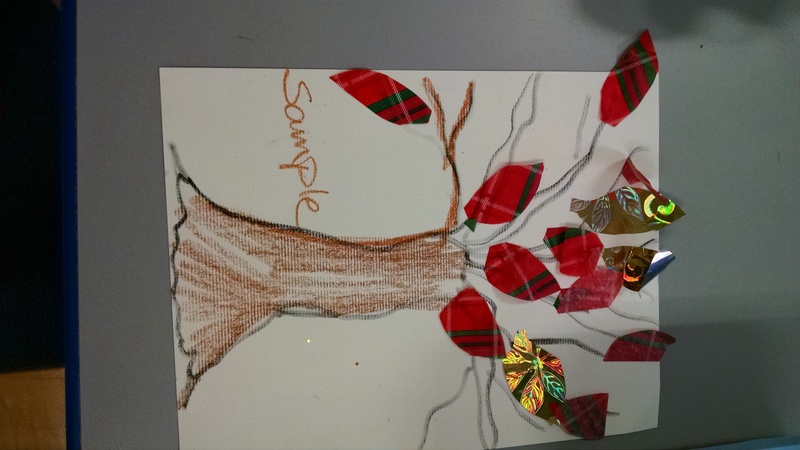 My co-teacher had the seasonally appropriate idea to do a tree instead, where the fall leaves flutter. They cut leaves out of tissue paper and Mylar wrapping paper. The key thing you need to explain to the kids is to only glue down PART of the leaf. They need to leave most of the leaf loose to flutter. Here’s sheet of instructions. K’nex has a set called Exploring Wind and Water Energy. 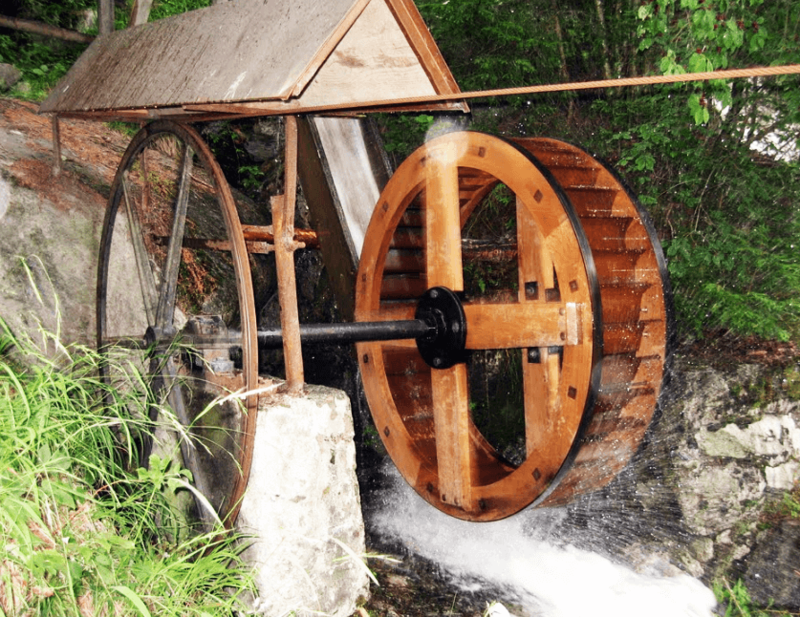 One of the projects you can make is this water powered generator. Your child can help to assemble it, then play with it. There are two big ideas to communicate: 1) things are made of atoms – atoms are made of protons, neutrons, and electrons. 2) Sometimes when things rub together, they lose electrons, and that “charges up” the item with static electricity. Parachute: Begin by playing with the parachute. Especially do games where the kids are under the parachute that’s going up and down. After a while, point out how all their hair is standing on end. It’s charged with static, and the hairs are “repulsing” each other and trying to move away from each other. If you want a theme song, play the Schoolhouse Rock Electricity Song. When it says anything else, ripple the parachute, but whenever it says “Electricity, Electricity” raise and lower the parachute twice. History: Share the history of Thales, mentioned above. 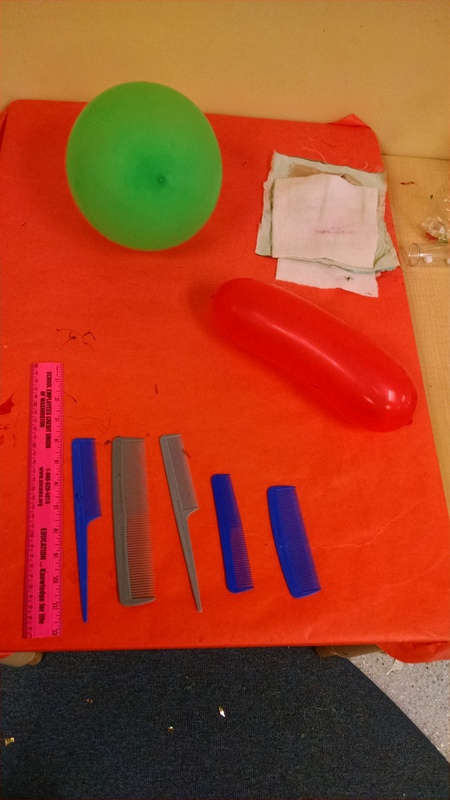 Static electricity demos: Use your hair to charge a balloon, or fabric to charge a comb, then demonstrate how tissue paper reacts, or how you can pick up rice cereal with it. These things are attracted to each other. Then lay an empty aluminum can on its side, and hold the static item near it. The can will either roll toward the balloon or away. (Learn more at Exploratorium.) Light a fluorescent bulb with static electricity. Our third big idea is: For electricity to work, you need a complete circuit. You connect the negative terminal on the battery to the output (a light or a buzzer) with something that conducts electricity (wire, water, conductive play-dough), then connect the output back to the positive terminal. This allows current to flow continuously. Ask the kids what they know about electricity, and how we use electricity. This grounds the rest of the discussion in their experience. Then we ask kids to suggest something that they use electricity for, and we substitute in those words. Electricity lights our streets… I know, I know. Electricity lights our streets, I know, I know. Intro: Thanks to the work of lots of scientists and inventors throughout history, we’ve figured out how to capture and store electricity. One of the places we store it is in a battery. We’ve also figured out how to help move electrons so they do work. For example, they can light a light, make a buzzer buzz, or turn a fan, like we did with the Snap Circuits and littleBits. To make any of these things work, we have to hook up the power source and the thing we want to power so electricity can move from one to the other. 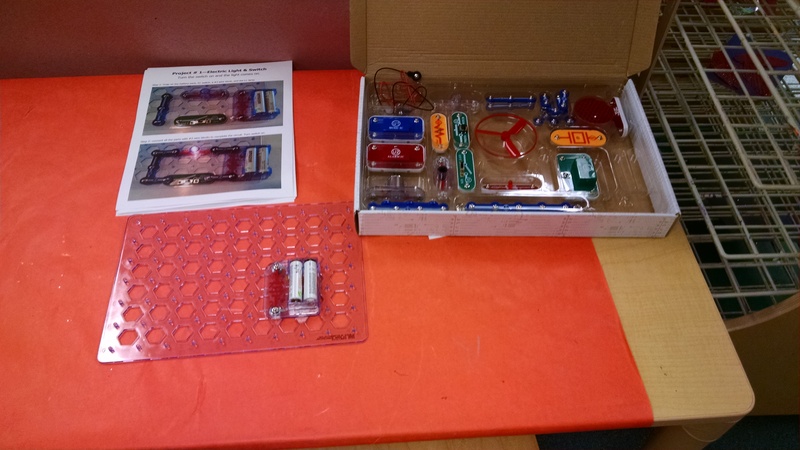 Circuits Demo: Use the batteries and lightbulbs and switches to demonstrate the idea of circuits and how current passes through a circuit. And how a switch interrupts the circuit. Pass the current: Have kids hold hands in a circle. Squeeze a child’s hand, they squeeze the next hand, and so on, to pass the current all the way around a circle. After you have done this, use your sensor toy (see above.) You touch one sensor. Have the child next to you touch the other sensor. Nothing happens. Hold hands with that child – you’ve completed the circuit – the light comes on, or the chick cheeps. Now, let go of that neighbor’s hand, and take the hand of the child on your other side. Have all the children join hands, so kids can see that the current travels from you through all of them, back to the sensor. When we all hold hands, the chick cheeps. If anyone lets go, it interrupts the circle, and the chick stops cheeping. You could also play either of the games described below. Oscar and the Bird. When Oscar the kitten finds a tractor in a field and accidentally turns on the windshield wipers, he is full of questions about electricity. Luckily, Bird knows the answers! With the help of his friend, Oscar finds out how electricity is made and stored, which machines need electricity to work — and why we always need to be careful around wires, batteries, plugs, and sockets. Ages 4 – 8. This would be a great SECOND book to read if we’d first read a book with a nice summary of basics of electricity. 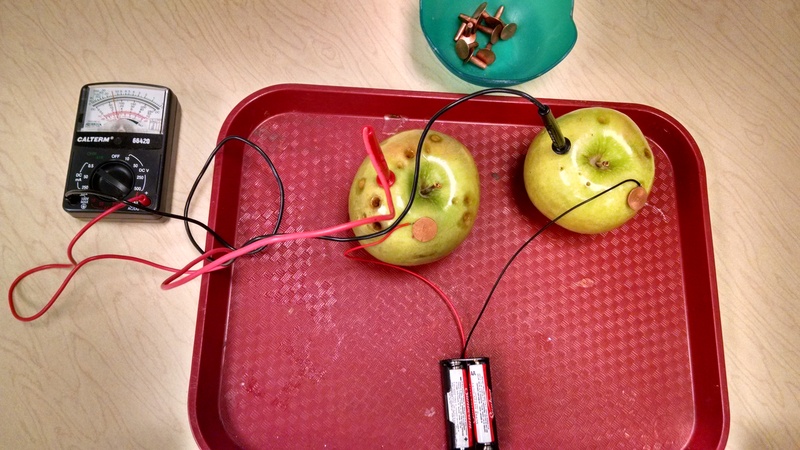 Electricity: Bulbs, Batteries, and Sparks (Amazing Science) . A little long, but otherwise a good circle book for ages 5 and up. (skip the “fun facts” when reading aloud.) Over the head of younger ones. Switch On, Switch Off by Berger. 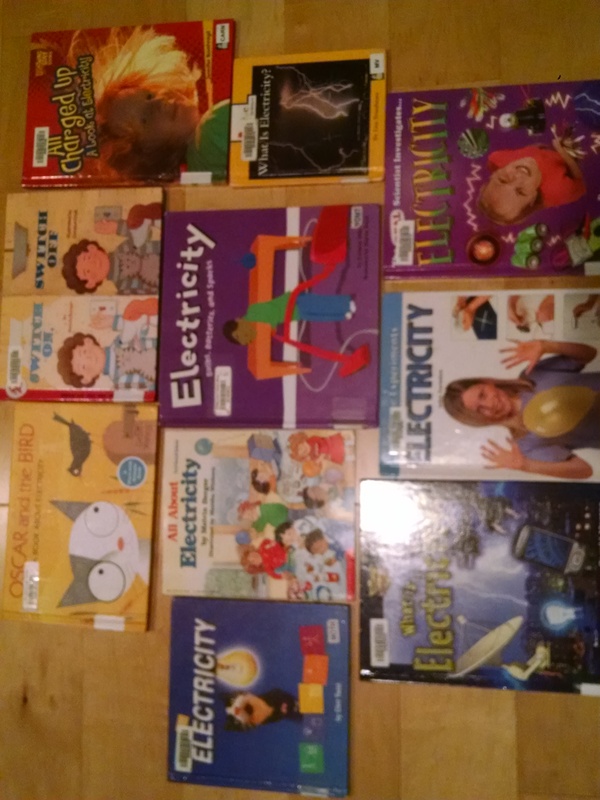 Library description: Explains how electricity is produced and transmitted, how to create electricity using wire and a magnet, how generators supply electricity for cities, and how electricity works in homes. Ages 6 – 8. Probably too long for circle. Good resource books for older kids (age 5+) and for experiment ideas. Not for circle. Electrons: Explain that all things are made up of molecules (reminder of the states of matter activities last week.) All molecules are made of atoms. Atoms are made of protons and neutrons which hold tight together in the nucleus, and electrons are held loosely. Give each child a die (or a coin) where some/one side is labelled “proton or neutron” and one is labeled electron. On each turn, they roll their die or flip their coin, then pick it up. If it says proton or neutron, they run to the center of the room and huddle together. If it says electron, they orbit in a circle around the protons and neutrons. Pass the Electron Game: This idea started with an idea on Hub Pages: http://hubpages.com/education/electricity-lesson-plan Have all the kids stand in a line. Tell them they are a copper wire. Give each one electron (a ball or other small toy). Tell them they’re a balanced copper atom. But, when the battery (the teacher) gives an extra electron to one child, they have to pass on one of their electrons as quick as they can. When the extra electron gets to the end of the line, flash a flashlight to show the electricity was discharged. We tried this in our morning class – the teacher told them that they should take the new electron in their left hand, pass the old one on, then pass the new one to the right hand. But it turned out that it was too much of a small motor challenge for our three and four year olds – they had a hard time transferring balls from hand to hand. There are two ways to fix that. One is that they hold THEIR electron in their left hand the whole time and always use their right hand to take and pass the new electron. The other is what we did in our afternoon class, where we just pretended they were holding their own balanced electron, and the only moving ball was the extra electron that was passed to them. We were then able to pass several electrons at once, for a “hot potato” style game. You can also curl the end of the circle to complete a circuit.